Micro Emacs v3.10 – clone of Emacs (UNIX) editor for PCs. into commercial software with the permission of the current author. MicroEMACS 3.10 is available in a couple of different ways. make EMACS, and UE310CMD.ARC which contains startup and command files. All the various executables are available individually. than I thought it would be, and is taking more time to get out. and agree with into the master sources. all the programs I am releasing. to one of these marks. translate old command files to the new bindings. FALSE to write it out again with the new algorithm. next word (as with next-word). 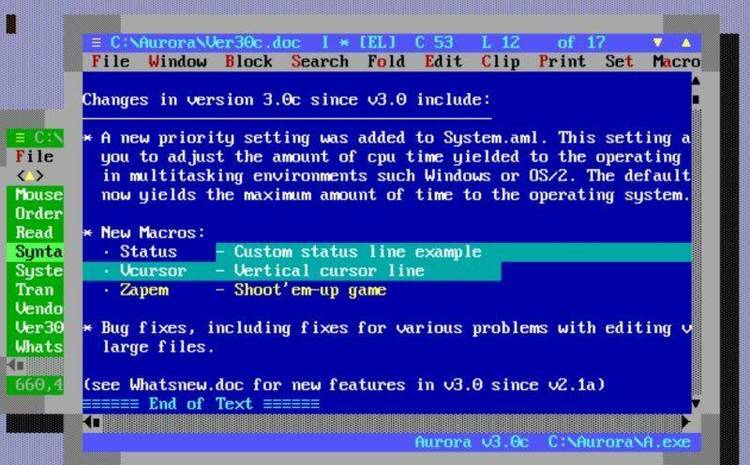 edits in VGA mode on a properly equipped IBM-PC. added $writehook to execute macroes when writing files. added $exbhook to execute macro when exiting an old buffer. added $bufhook to execute macro when entering a new buffer. old names will hang about for a version, then disappear. the text messages generated by EMACS itself are translated. unusual and magical casing rules. the user. the resulting string is suitable for binding commands. default value is 8, but may be changed by the user. then deletes the original, then renames the temp file as the original. characters the screen scrolls right or left. and user variables and their contents in a buffer. modelines by setting $modeflag to FALSE. file to see how this works. IBM's VGA display adapter in 50 line mode is now supported. 30% to the speed of macro execution under all environments. by apx 30% on the IBM-PC and under UNIX. aborting a query-replace with the '.' character has been eliminated. system. Also the Data General mainframe computers are supported. is now fully supported as well. Williams C for error parsing. specific actions. In the past these were bound to illegal keystrokes. these "hooks" that contains the name of a macro to execute at hook time. after it's buffer has been created. is set to wrap-word by default. complete the name from the available buffer list. reset by setting the $sterm variable. MicroEMACS to attempt to complete the name for you. supported on the Commodore Amiga.